In one earlier post, I noted a form of bond stretch isomerism that can arise from a Jahn-Teller distortion ending in two different geometries in which one or more pairs of bonds swap short/long lengths. Examples include substituted cyclo-octatetraenes and octahedral d9-Cu(II) complexes. A more interesting seminal possibility was implied by G. N. Lewis a century ago when discussing the arrangement of electrons in a (carbon-carbon) triple bond. *It took ~50 years to prove this assertion wrong. 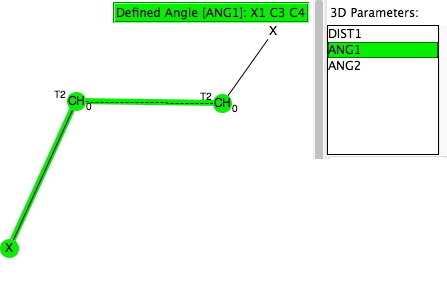 In a commentary, I reported the results of a search of the crystal structure database for the geometries associated with RX≡XR systems (X= C, Si, Ge, Sn, Pb). Here I focus the search specifically for X=Sn,Ge; this version of bond stretch isomerism also allows angles to change (= rehybridisation at atoms) in order to provide a mechanism for a barrier separating the two forms. 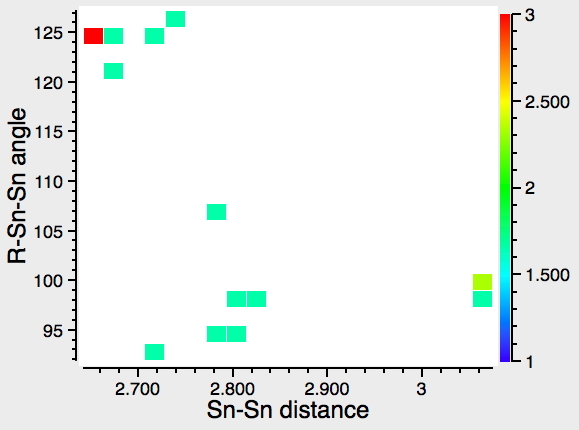 For X=Sn, note the presence of up to three clusters, although the relatively low number of hits makes the statistics less certain. The hotspot cluster centered around angles of 125° and a Sn-Sn distance of ~2.6Å. Another with angles of <100° and Sn-Sn distances of ~3.3Å. A third with angles of <100° and Sn-Sn distances of 2.8Å, which may or may not be a genuine unique form of bonding. Time for some computations (which at least will remove random errors in the geometry). I selected the only known example of an RPb-PbR compound as a seed and put it through a B3LYP+D3/Def2-TZVPP calculation (with 172 atoms and 2920 basis functions, this is a relatively large calculation! ), which reproduces the known structure pretty well (table). So what about another bond stretch isomers? The Pb=Pb variation is indeed a stable minimum around 28.0 kcal/mol above the known structure, which seems to put this form out of experimental reach (with this ligand/aryl group at least). With Sn for the same aryl ligand, the energy difference is smaller (~15.8 kcal/mol for this ligand; Powers reports other systems where the energy difference may be only ~5 kcal/mol). Judging by the distribution of the 13 hits recovered from the CSD search, both bond stretch isomers may be accessible experimentally. The calculations show that the GeGe bond isomers are much closer in energy than SnSn (for this ligand). For all three metals however, the calculated difference in the metal-metal length for the two isomers is ~0.45 – 0.52Å. This strongly suggests that whereas the SnSn plot above is demonstrating bond length isomerism, the GeGe plot may not be; at least not of the same type that the calculations here are revealing (via the Wiberg bond orders). 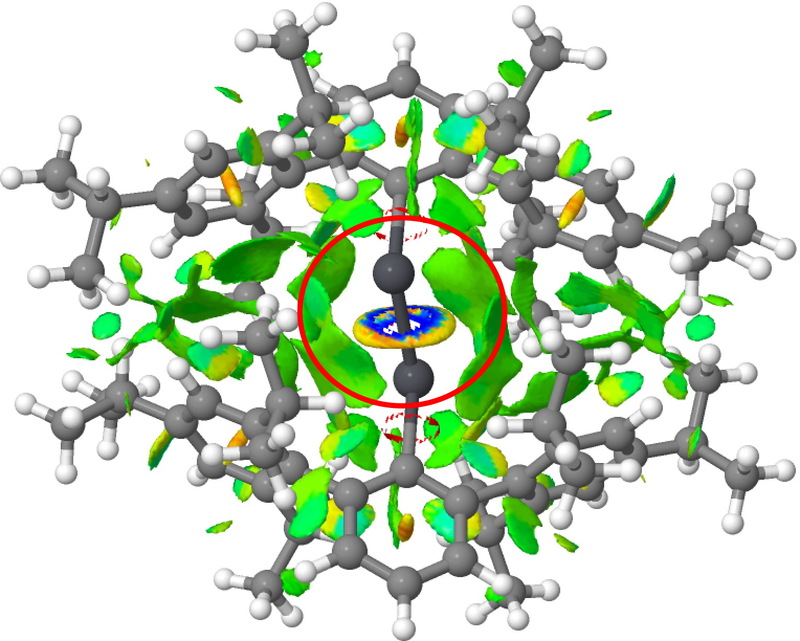 No doubt the particular bond length form is being facilitated by the nature of the ligand and the steric interactions therein imparted, both repulsive AND attractive. These interactions can be visualised via NCI (non-covalent-interaction) plots (click on the image to obtain a rotatable 3D model). First Pb-Pb followed by Pb=Pb. Note how in both cases, the PbPb region is enclosed in regions of weak attractive dispersion interactions, which however avoid the "hemidirected" inert Pb lone pairs. So in the end we have something of a mystery. 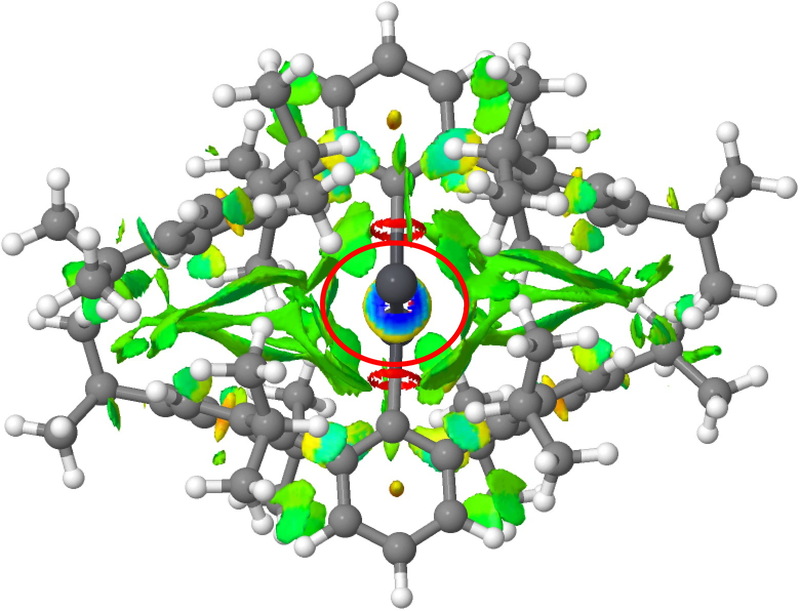 There is evidence from crystal structures that at least two bond-stretch isomers of RSnSnR compounds can form, but the calculations indicate that the Sn=Sn form is significantly higher in energy (although not impossibly so for thermal accessibility). 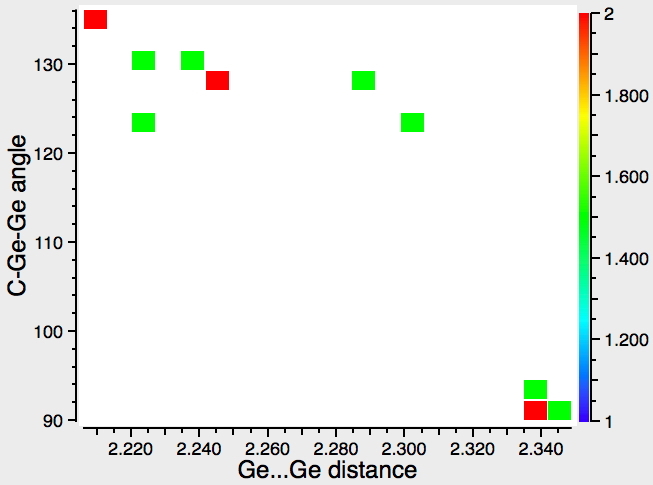 Conversely, the Ge=Ge equivalent is very similar in energy to a Ge-Ge form with a significantly longer bond length, but there seems no crystallographic evidence for such a big difference in bond lengths. Perhaps the answer lies with the ligands? It seems particularly appropriate on the centenary of G. N. Lewis' famous paper in which he clearly notes the possibility of three isomeric forms for the triple bond, to pay tribute to the impact his suggestions continue to make to chemistry. This entry was posted on Tuesday, February 9th, 2016 at 7:34 am and is filed under crystal_structure_mining, Historical. You can follow any responses to this entry through the RSS 2.0 feed. You can leave a response, or trackback from your own site. This is by way of a control experiment, a CSD search for R-CC-R, as defined by the search query shown below. 2. An odd collection of outliers, especially at angles of 115-105° and CC lengths of ~1.45-1.50Å. This latter deserved closer inspection of individual examples. All the ones I looked at seemed to be errors associated with the hydrogen count. Although the search query specified no hydrogens attached to either central C, the outliers clearly do have them; they are simply mis-assigned or mis-registered. One example illustrates this; GEJXIC (1,7-cyclododecadiyne), where the wrong atoms are indexed as the C≡C. 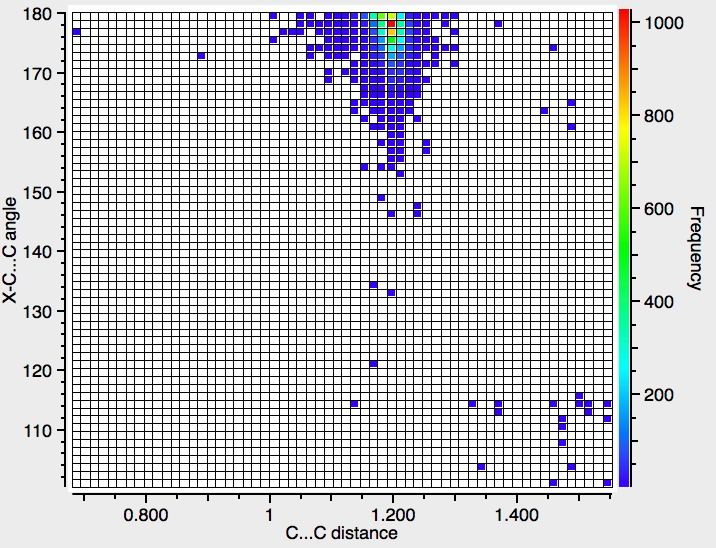 Having said that, I did not inspect all the outliers, and it is always possible that one of them does illustrate a C≡C with unusually long CC distance that might constitute one of Lewis' isomers.